An artists’ conception of the X-37B in Earth orbit. Credit: U.S. Air Force. 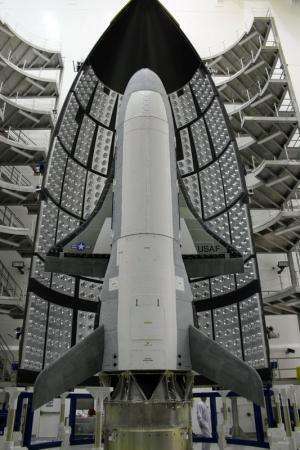 A secretive mission will pass a quiet milestone at the end of this month when the U.S. Air Force's unmanned spaceplane the X-37B surpasses 500 days in space. The spacecraft itself is solar powered, as it unfurls a panel—as depicted in many artists' conceptions—once it's in orbit. 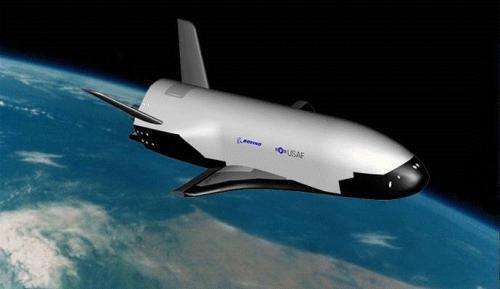 Of course, its mission profile is classified, and the X-37B could land unannounced at any time. The previous landings occurred at Vandenberg Air Force Base in California and were only announced shortly thereafter. The idea of a reusable spaceplane has been around since the dawn of the Space Age. The U.S. Space Shuttle program was the most high profile of these, having flown 135 missions from 1981 to 2011. But even the space shuttle launch system wasn't fully reusable, expending its large orange external fuel tank after every mission and requiring extensive refurbishment for the solid rocket motors and orbiter after each and every flight. The Soviets abandoned Buran in 1988, and other examples of spaceplanes such as North American's X-15 surpassed the 100 kilometre in altitude Kármán line marking the boundary to space, but were suborbital only. And this year, customers may get a chance to make similar suborbital hops into space aboard Virgin Galactic's SpaceShipTwo spaceplane at $250,000 dollars a ticket. But the most ambitious design for a true spaceplane was conceived in the 1960's: Boeing's X-20 Dyna-Soar, which was never built. Classified satellites such as the X-37B are part of a longstanding and fascinating "secret space race" that has paralleled and shadowed the more well known space programs of various nations over the decades. These include the Corona program which ran from 1959 to 1972 and was only declassified in 1995, and satellites such as Lacrosse 5, which is notorious among satellite sleuths for the orbital "vanishing act" it sometimes pulls. And speaking of which, you can track the X-37B from your backyard, tonight. Ground spotters first pegged its position in low Earth orbit during OTV-1 on May 22nd 2010, and the spacecraft currently sits in a 392 x 296 kilometre (nearly circular) orbit in an 43.5 degree inclination, making it visible from latitudes 55 degrees north to south. 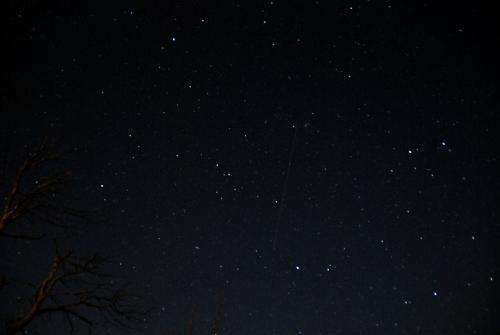 On a favorable overhead pass, the X-37B is easily visible shining at greater than magnitude +1. OTV-3's NORAD ID designation is 39025 or 2012-071A, and although – like most classified payloads – it's not available to the public on Space-Track, Heavens-Above does list upcoming sighting opportunities. Be sure to start watching a bit early, as the X-37B has been known to maneuver a bit in its orbit on occasion. Of course, just what the X-37B is doing in orbit is anybody's guess. Speculation is that it's serving as a test bed for new technologies. Certainly, the ability to place interchangeable payloads in orbit is immediately apparent. It's also worth noting that the X-37B makes multiple daily passes on its northward apex over North Korea and China. There's also been speculation that the X-37B was designed to keep tabs on the Chinese space station Tiangong-1, although this can easily be refuted as they both lie in different orbits. There's no word as to what's to become of Tiangong-1, though China had said it was set to deorbit the station at the end of 2013, and it is still in space. Looking ahead into the future, there has been talk about a larger crewed variant known as the X-37C, which will undoubtedly fly much shorter missions. For now, we can watch and wonder what it's up to, as the X-37B glides silently overhead. Perhaps one day, its mission will declassified, and its tale can be told.